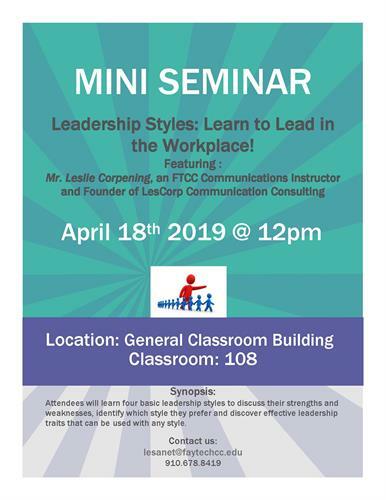 Join FTCC Communications Instructor and founder of LesCorp Communication Consulting on Thursday, April 18, at 12 noon inside the General Classroom Building, Room 108 (2817 Fort Bragg Road in Fayetteville) for this mini seminar on the four basic leadership styles to include discussion about the strengths and weaknesses of each style, identifying which style participants prefer, and discovering effective leadership traits that can be used with any style. This event is open to the public and is presented at the Fayetteville campus of Fayetteville Technical Community College. Questions may be directed to Tiffany Lesane (lesanet@faytechcc.edu) or (910) 678-8419.